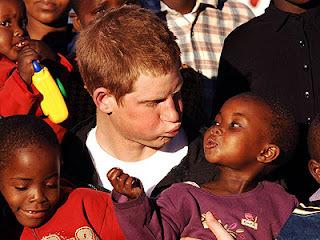 According to sources from British Royal Family, Prince Harry was thrown out of the house just ahead of the arrival of Kate Middleton's baby to ensure that this time at least Royal Family will have some sensible kid. "Actually, it was a unanimous decision of the family to move Prince Harry to Bermuda Islands so that he would never have any impact on the new born baby still lying in Kate's tummy," said a sweeper of the Royal Family who was present there when the family decided. He said "While first Harry reacted with amazement by pulling outside his both the eyes and asked why he was going to get a temporary retirement from the position of the Royal Family, Queen told him that she wanted to ensure Kate's kid to be normal and not a suspicious specie like him." She said "I can't tolerate another stupid animal like abnormal Kings and Prince of the United Kingdom. While watching you and William he would become like you both guys." The family bought a hut in the Bermuda Island and provided all the required amenities such as a two wheeler, different fruits, 10 kg of rice, lots of breads and one bottle of wine. According to sources, Queen Elizabeth also threatened Prince William, Kate's spouse to improve his stupid acts otherwise he would have to give company to Prince Harry.